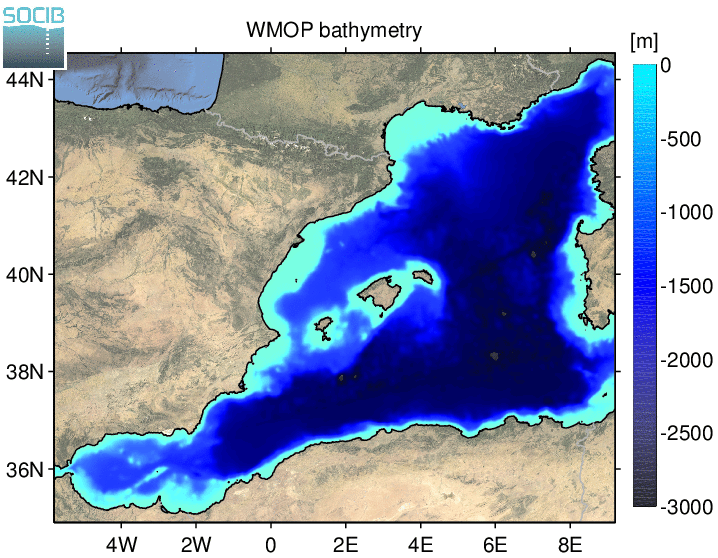 WMOP is a high-resolution ocean forecasting system implemented over the Western Mediterranean Sea. It is run operationally on a daily basis, producing 72-hour forecasts of ocean temperature, salinity, sea level and currents (Juza et al., 2016(1), Mourre et al., 2018(2)). Systematic validation procedures based on the inter-comparison of model outputs and satellite and in-situ observations are implemented to continuously assess the accuracy of the model. Model indicators (volume transports, average temperature, salinity, kinetic energy and heat content, maximum mixed layer depth) are also computed every day to monitor the system. Climatological rivers runoffs of Var, Rhône, Aude, Hérault, Ebro and Júcar rivers computed from averaged daily values over the period 2009-2013 provided by the French HYDRO database and the Spanish hydrographic confederations of Ebro and Júcar rivers. Model updates every 3 days after assimilation of sea-level along-track altimetry data, satellite sea surface temperature, Argo temperature and salinity profiles and Ibiza Channel HF radar surface currents observations. Observations are assimilated through a local multi-model ensemble optimal interpolation scheme, as described in Hernandez-Lasheras and Mourre, 2018(6). Ouput variables: temperature, salinity, currents, and sea level (saved every 3 hours at the surface, and as daily averages under the surface). (1) Juza, M., Mourre, B., Renault, L., Gómara, S., Sebastián, K., Lora, S., Beltran, J.P., Frontera, B., Garau, B., Troupin, C., Torner, M., Heslop, E., Casas, B., Escudier, R., Vizoso, G., Tintoré, J. (2016). SOCIB operational ocean forecasting system and multi-platform validation in the Western Mediterranean Sea. Journal of Operational Oceanography, 9, s155-s166. (2) Mourre B., E. Aguiar, M. Juza, J. Hernandez-Lasheras, E. Reyes, E. Heslop, R. Escudier, E. Cutolo, S. Ruiz, E. Mason, A. Pascual and J. Tintoré (2018). Assessment of high-resolution regional ocean prediction systems using muli-platform observations: illustrations in the Western Mediterranean Sea. In “New Frontiers in Operational Oceanography”, E. Chassignet, A. Pascual, J. Tintoré and J. Verron, Eds, GODAE Ocean View, 663-694, doi: 10.17125/gov2018.ch24. (3) Shchepetkin, A. F. and McWilliams, J.C. (2005), The regional oceanic modeling system (ROMS): a split explicit, free-surface, topography-following-coordinate oceanic model. Ocean Modelling, 9, 347–404. (4) Smith, W. H. F., and Sandwell, D.T. (1997), Global sea floor topography from satellite altimetry and ship depth soundings, Science, 277, 1956–1962. (6) Hernandez-Lasheras J. and B. Mourre (2018). Dense CTD survey versus glider fleet sampling : comparing data assimilation performance in a regional ocean model West of Sardinia. Ocean Sci., 14, 1069-1084, doi:10.5194/os-14-1069-2018.